The world of Beatrix Potter just got a whole lot more verdant with the introduction of Peter Rabbit Naturally Better, an environmentally friendly collection of books, food, toiletries, and toys based on the author’s much-beloved characters. Featuring Mr. McGregor’s carrot-chomping nemesis and friends redrawn in a fresh, contemporary style, the line embraces a Corporate Social Responsibility charter that promotes ethical labor practices, sustainable production and packaging, and transparent labeling. 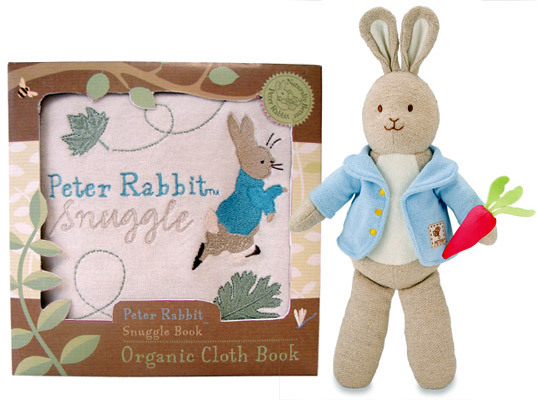 Our top picks: Peter Rabbit Snuggle, an organic cotton flannel book with colored stitching and appliquéd character images, and an equally huggable organic cotton plush doll of our eponymous hero. The world of Beatrix Potter just got a whole lot more verdant with the introduction of Peter Rabbit Naturally Better, an environmentally friendly collection of books, food, toiletries, and toys based on the author's much-beloved characters. Featuring Mr. McGregor's carrot-chomping nemesis and friends redrawn in a fresh, contemporary style, the line embraces a Corporate Social Responsibility charter that promotes ethical labor practices, sustainable production and packaging, and transparent labeling. Our top picks: Peter Rabbit Snuggle, an organic cotton flannel book with colored stitching and appliqu�d character images, and an equally huggable organic cotton plush doll of our eponymous hero.